It seems the holidays sneak up on us faster every year -- and the short span of time between carving the turkey and ringing in the new year flies by faster, too. In order to help you make the most of the season, we’ve rounded up the best events in the Twin Cities that will bring out the kid in you -- and that you can bring your kids to. And, if bar crawls and boozy holiday bazaars are more your thing, we’ve got those as well. There’s a little something for everyone -- just like the season itself. The popular Sunday holiday market returns to Linden Hills’ Sunnyside Gardens this year with more than 60 local vendors including Liege Waffles, Winter Goddess Foods, Num Nuts, and Coconut Whisk Baking Co. Along with food, you can find unique seasonal gifts including handmade candles, jewelry, clothing, decor, and wreaths -- and there’s a Christmas tree lot next door, too. With this year’s The Grinch movie currently out, bring your small ones to the Children’s Theatre to see Dr. Seuss’ popular tale performed as a play. The cast is comprised of local student actors and differs slightly from some adaptations to be kid-friendly but don’t worry -- The Grinch is still crabby prior to saving Whoville’s holiday. A night out at The Guthrie is always worth dressing up for, and every year A Christmas Carol draws a well-heeled crowd. The cast is always awesome -- and last year, the first woman ever to play Scrooge at the Guthrie took the stage, so you never know what 2018 will bring. It’s always the fastest-going ticket in town though, so plan accordingly. If you’re a parent, thank your lucky stars the Holidazzle Parade along Nicollet Mall was re-invented as a holiday celebration in Loring Park. There's ample room to seek shelter if it’s freezing, and there’s always great food and booze. You can also see Santa, listen to carolers, shop Faribault blankets and Love Your Melon hats, and go ice-skating, all without leaving the park. If you want to see some awesome decked-out trees and winter lights, look no further than the arboretum. With both indoor and outdoor displays, they have evergreens, poinsettias, and lots of bulbs. New this year is the S’mores Village, where you can buy a package to roast and create s’mores for your whole group. Still a transit hub, Union Depot is also billing itself as a #HubForTheHolidays this year. The season kicks off with a tree-lighting ceremony and fireworks and continues with the European Christmas Market on the East Plaza. Throughout the holiday season, there will also be special visits by the North Pole Express and Canadian Pacific holiday trains. Find trendy gifts at "Bizarre Bazaar"
Best described as kitschy and quirky, Betty’s takes the holiday market to a whole 'nother level with “Betty’s Bizarre Bazaar.” Not the craft sale of your youth held in an elementary school, the Bazaar serves up strong cocktails as you shop local vendors. When you’re done, don’t miss riding Betty’s outdoor ferris wheel in the parking lot. You’re probably not shocked to learn Minnesota is the state with the highest percentage of Scandinavian-Americans, and if your family celebrates any Nordic/Swedish/Danish traditions, ASI’s got you covered. Julmarknad -- their holiday market and festival -- will have over 40 local artisans, crafts for the kids, and a bake sale by their restaurant FIKA. There’s no better place to experience a true Nordic Christmas, if that’s your thing. After Macy’s downtown Minneapolis closed last year, there was a hole in the Twin Cities Santa scene. Fear not, the Minnesota Zoo is hosting Breakfast with Santa, but you have to be a zoo member to sign up. The breakfast includes crafts, coloring, animals, and a meet-and-greet with the jolly guy where you can snap a photo. ‘Tis the season to be merry! And what could be merrier than hopping on a bus with a bunch of strangers and hitting up some Minnesota breweries? The tour includes stops at Flat Earth, 12welve Eyes, and Bad Weather, and in between downing suds, you’ll see the city’s best holiday lights. For a chance to win an extra pint, wear a festive outfit or ugly holiday sweater. The family-friendly play The Chanukah Guest is a great opportunity to celebrate and/or teach kids about Hanukkah. Minnesota Jewish Theatre Company also offers school field trip performances. The play is appropriate for all ages -- and also funny. Every year, Top 40 station KDWB brings a star-studded show to St. Paul that may or may not feature the performers belting out holiday hits. This year’s lineup is led by The Chainsmokers and also features 5 Seconds Of Summer, Bebe Rexha, Bazzi, Sabrina Carpenter, and more. Expect a lot of the crowd to be under 18, but if you have teens, it’s a show you can both enjoy. If you need a break from holiday tradition, catch contestants from VH1’s reality TV show strut their stuff to Christmas classics onstage. Featuring tons of glitter, of course, A Drag Queen Christmas: The Naughty Tour is a hilarious evening of inappropriate fun. 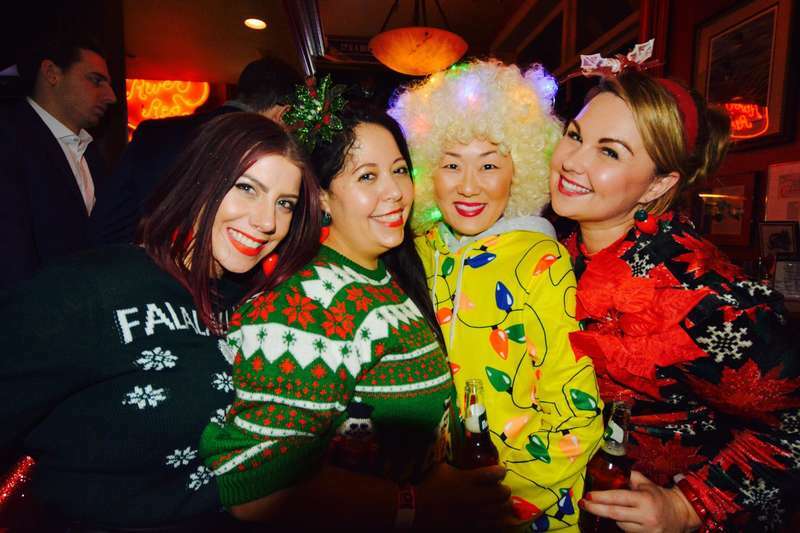 The largest holiday bar crawl by far, 12 Bars of Christmas returns this year for its 15th season. Hordes of people wearing matching shirts, Santa costumes, and reindeer onesies will take over the Warehouse District, spreading Christmas cheer (sometimes in excess.) Either a 12BoC pre-ordered shirt or wristband gets crawlers free cover and drink specials, but both sell out, so hop to it. As the popular distillery rightfully points out, going to the Tattersall Holiday Market is a thousand times better than going to the mall. What could be better than drinking bourbon while buying gifts from more than 40 vendors for friends and family? Some featured shops include Minny & Paul, sota clothing, Cookie Cart, and, of course, Tattersall for spirits. Feeling guilty about all the Christmas cookies you’ve been eating? The annual Reindeer Run around Lake Harriet is the perfect chance to torch some calories. Sign up for the 5K, 10K, or “Yukon Challenge” 15K. All runners receive a race medal and long-sleeve performance shirt. Some of the best holiday lights around can be seen along Lake Minnetonka, so grab the kids and head west to “Christmas in Excelsior.” After looping around the bays and checking out massive, decked-out homes, head to Excelsior to see Santa at the Masonic Lodge which also features a hot cocoa bar. A classic holiday experience, Loyce Houlton’s Nutcracker Fantasy promises larger-than-life props, a 60-foot Christmas tree, and the best ballerinas. Even if your partner isn’t really into ballet, Nutcracker Fantasy is more of a theatrical production than anything. If you promise pre-performance cocktails at Crave, your odds of success may increase. The holidays don’t get much more traditional than catching the Trans-Siberian Orchestra’s holiday tour... Even though this year they’re passing through town after Christmas, the classics are always in season. The retractable rooftop hosts their fifth annual three-level New Year’s Eve blowout, which this year will be Gotham City-themed. Each level will have a different style of music including pop, hip-hop, and EDM. You’ll definitely see a lot of Batmen, Robins, and Catwomen, so plan a costume accordingly. Dust off your fanny pack and shoulder pads, don your scrunchie and spandex, and bring your Zach Morris phone because First Ave. knows how to ring in the new year right. DJ Jake Rudh is teaming up with 89.3 The Current, Electric Fetus, and Surly Brewing to present "'80s Prom: A New Year’s Celebration" at First Ave. Expect Madonna, Michael, Prince, Salt-N-Pepa, and more. The live music venue is throwing it back this year -- all the way back to Y2K -- with “A 90’s New Years Eve.” Band You Oughta Know and A/V group The 90’s Preservation Society will transport you to 1999 -- but this time you won’t have to stockpile canned goods in anticipation of the millennium. Jenna Bennett is a writer for Thrillist who will spend the holidays doing the most basic of things, including wearing a Love Your Melon hat to Holidazzle while drinking a seasonal coffee. Follow her on Twitter and Instagram @jennasbennett.